1.1 Northeast Monsoon conditions prevailed in the second fortnight of January 2019. Northeasterly and easterly winds prevailed over the northern ASEAN region and South China Sea due to a persistent high pressure system over north Asia. 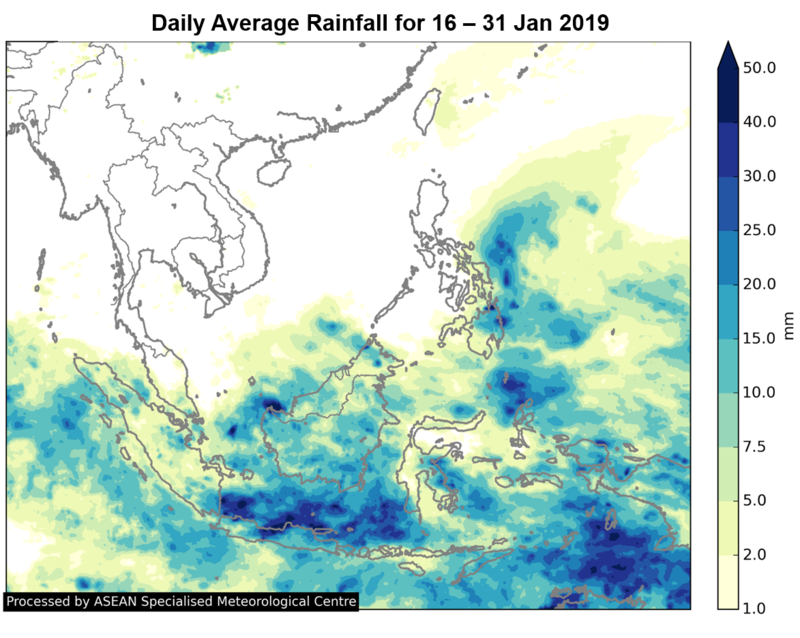 There were anomalously strong northwesterly and northeasterly winds over the southern ASEAN region with the monsoon trough situated south of the Equator. 1.2 Dry weather persisted over the Mekong sub-region, except for isolated showers over coastal Viet Nam on a few days due to strengthening of winds over the South China Sea. 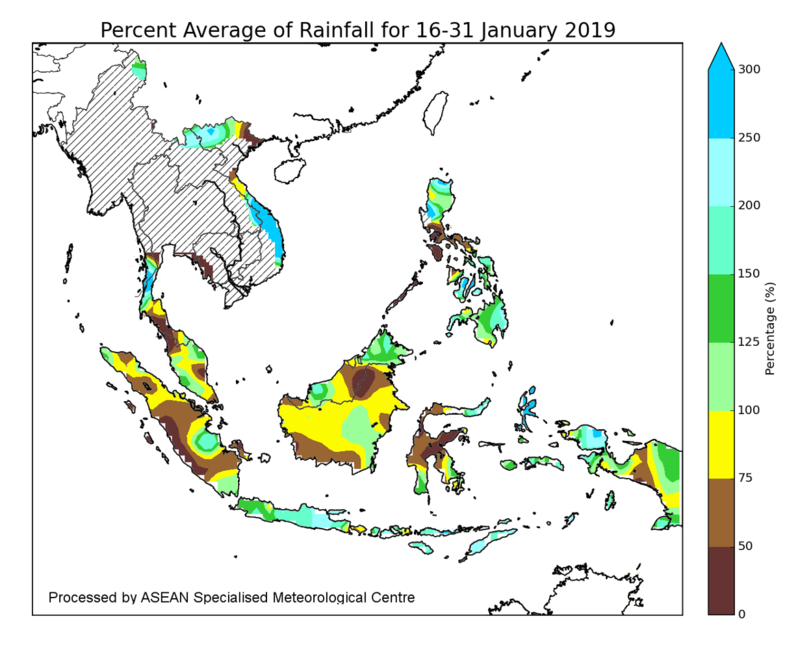 Above-average rainfall was observed over the Philippines and parts of the southern ASEAN region. 1.3 The daily average rainfall and the percentage of average rainfall for the second fortnight of January 2019 are shown in Figure 2 and Figure 3 respectively. 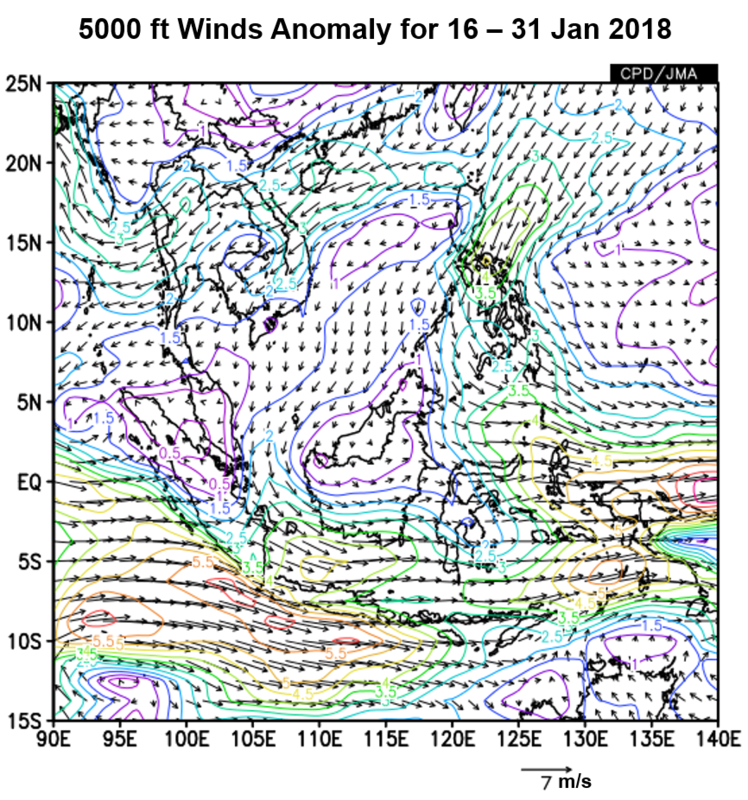 1.4 The anomalously strong northwesterly and northeasterly winds in the southern ASEAN region could also be attributed to Tropical Cyclone Riley that developed over the Indian Ocean, northwest of Western Australia on 24 January 2019. Tropical Cyclone Riley subsequently tracked southwestwards and gradually weakened over the Indian Ocean by 30 January 2019. 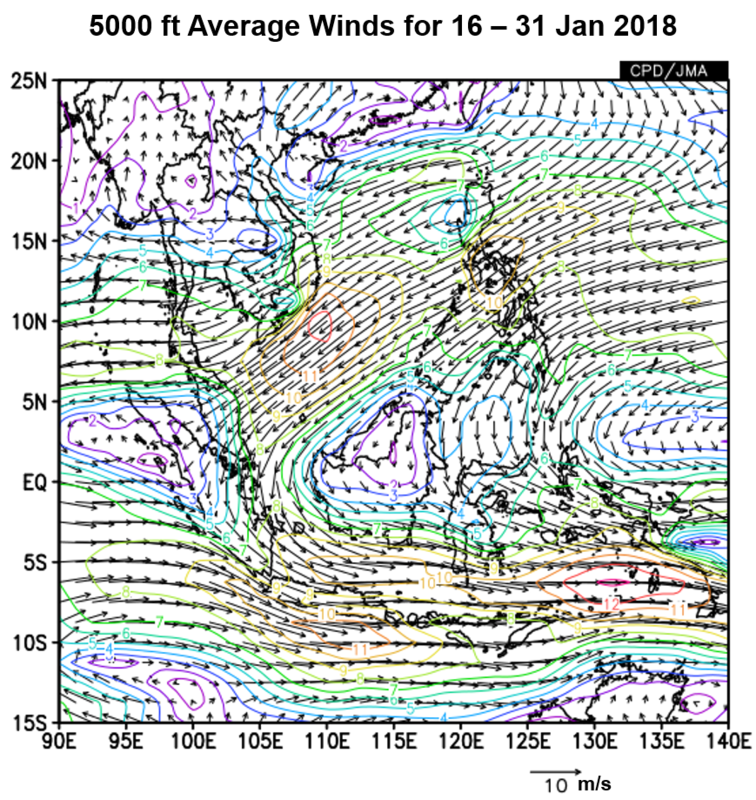 During this period, upstream wind-flow feeding into Tropical Cyclone Riley contributed to the scattered shower activities over the southern ASEAN region. 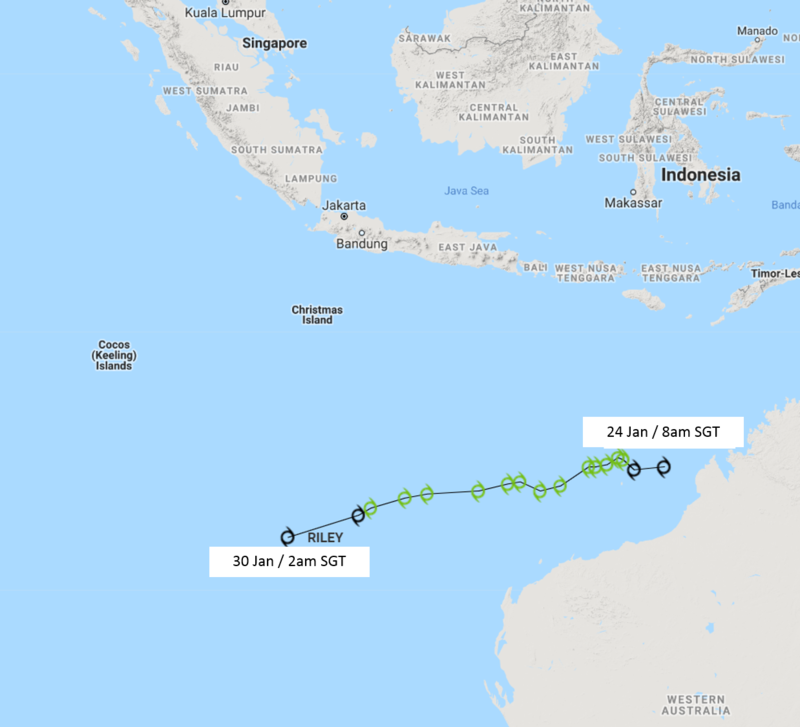 The track of tropical cyclone Riley from 24 January 2019 to 30 January 2019 is shown in Figure 4. Figure 4: Track for Typhoon Riley (24 Jan – 30 Jan 2019). 1.5 The sea surface temperatures (SST) over the tropical Pacific Ocean remained slightly warmer than average, although they have cooled slightly over the past fortnight. Overall positive SST anomalies are weak and returning to neutral. 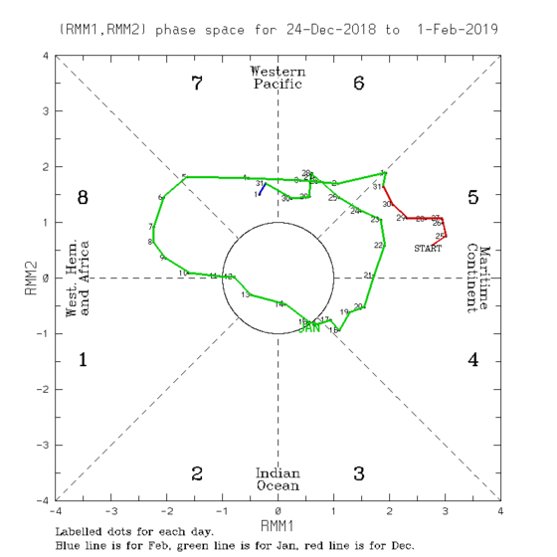 The prevailing atmospheric conditions such as cloudiness remained neutral, and the trade winds have weakened across the central and western Pacific. 1.6 The Madden Julian Oscillation (MJO) strengthened and propagated through Phase 4 – 7 during the fortnight. MJO Phase 4 typically brings wetter weather mainly over the south and southwestern part of the ASEAN region, and has weaker influence over the Philippines and the surrounding areas. MJO signals in Phases 6 – 7 typically bring drier conditions to the region. However, there was no dominant factor influencing the rainfall pattern over the region attributable to the MJO signals.